Sportsfans, after months of waiting, the NBA’s second season is finally upon us. Those tuning in are about to witness basketball played at its highest level. Even after a full season, this year’s champion is still anyone’s guess. In my season preview back in October, I wrote that only a select few (Los Angeles, Orlando, Cleveland, Denver, Dallas, San Antonio, Boston) had a legitimate chance to win a title. Not that I was going out on a limb but over 82 games, that has proven to be the case. The 2010 season has provided us with some pleasant surprises, such as Kevin Durant’s Oklahoma City Thunder, but it’s safe to say those seven aforementioned teams are still the overwhelming favorites. In anticipation of the playoffs, here are ten questions surrounding this year’s contenders as they begin their quest for NBA immortality. 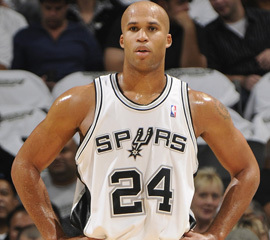 10 – Can Richard Jefferson spur the difference in San Antonio? When a team loses one of its best players to injury, it’s unrealistic to expect them to compete for a title. When that player is a Frenchman who perennially leads the league in points in the paint as a POINT GUARD, chances are even slimmer. In Parker’s month-long absence due to a broken hand, the Spurs opted for point guard by committee but Parker’s roster spot is irreplaceable. The good news for Spurs fans is that Mr. Longoria has been cleared to play just in time for the playoffs. The Spurs went 11-5 without Parker but likely couldn’t make a serious run without him in the starting lineup. We’ll see how the time off affects one of the best point guards in the game. He should have fresh legs but will his hand be 100%? Regardless, his return makes San Antonio legitimate title contenders. In a Western Conference that has been dominated by the Lakers for most of the season, the Spurs, even though they’re 15 games above .500, have hovered near the bottom half of the Western Conference playoff teams. That means they will likely have to play one of the top teams on the road right out of the gate. The last thing they want is to face the Lakers in the first round. That’s not to say they can’t pull off the upset but the cards are stacked against anyone playing Kobe Bryant. San Antonio signed Richard Jefferson last summer to inject more scoring into their lineup but so far the acquisition hasn’t been a good fit. RJ is averaging only 12 points per game this season, his career low by far. Jefferson needs to be a consistent scoring threat if the Spurs want any shot at making a deep run. 9 – Are these Jazz for real or are they simply playing the same old tune? John Stockton, Karl Malone and Jeff Hornacek took Utah to the NBA Finals twice in the 1990s only to lose to Michael Jordan’s Bulls. This current team, still coached by Jerry Sloan, has yet to match the success of its predecessors. Despite Utah’s consistently solid regular season records over the past few years, they have yet to pose a legitimate post-season threat. They finished this season on a tear, posting a 12-5 record in March and challenging Denver for the top spot in the Northwest division. Winning the division means home court advantage, a move that would seriously help a team like Utah who is 32-8 at home. 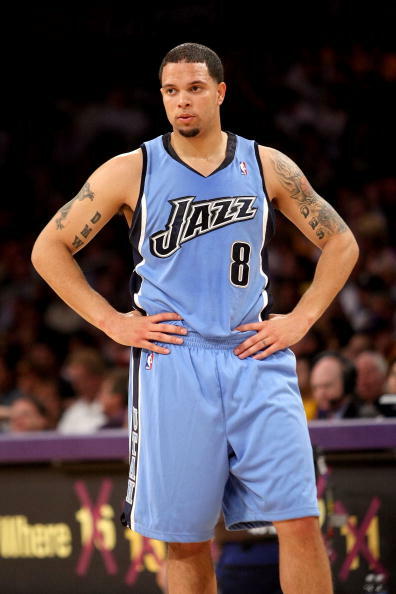 This Jazz team features basically the same roster as years past. Carlos Boozer leads the team in both scoring and rebounding and Deron Williams has established himself as arguably the best point guard in the game. Mehmet Okur and Andrei Kirilenko are both averaging around 12 points a game although Kirilenko has been hampered by a bum hamstring. The Jazz will need a healthy and inspired Kirilenko if they want to make a serious run. Utah is second in the league in field goal percentage AND free throw attempts which means the team is both taking, and making, good shots. They’ll need all that and more in June if they want to bring Jerry Sloan his first ever NBA title. 8 – Can these Atlanta Hawks finally fly? It certainly appears so. If nothing else, the Hawks have been consistent all season long. They’re young but have proven they can run with the big boys. They’ve owned the Celtics (4-0) this season but are 1-6 against Cleveland and Orlando and those are the two teams they need to worry about at this point. 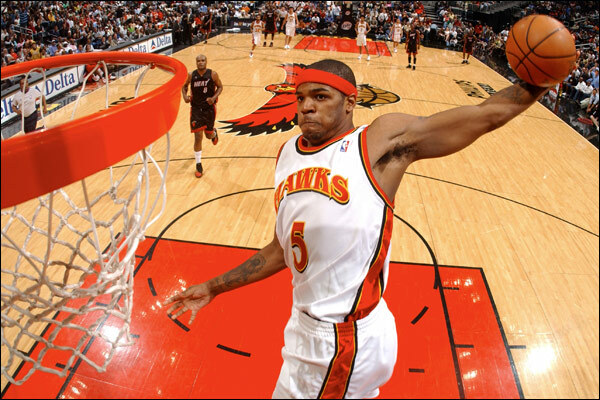 The Hawks have six players (Joe Johnson, Jamal Crawford, Josh Smith, Al Horford, Marvin Williams, Mike Bibby) scoring over nine points a game, which means their offense can come from anywhere at any given time. Over the past two seasons, this team has taken its post-season lumps, including taking the eventual champion Boston Celtics to seven games in an unforgettable series two seasons ago. Last year they got swept by the Cavaliers in the second round. Atlanta should have no problems advancing to the second round of these playoffs but it’s when they face either Boston, Cleveland or Orlando that the Hawks will once again be tested. Atlanta is one year closer to taking the next step. I’m just not so sure this is the year. 7 – Can Kevin Durant continue his thunderous downpour? The NBA is on the verge of welcoming a new superstar. Or better yet, he’s already here. I remember watching Durant light it up as a Texas freshman and wondering if his lanky frame would excel at the next level. Who knew it would only take three seasons for him to average thirty points per game? By many accounts, he’s this season’s MVP. The casual NBA fan was introduced to Kevin Durant over a mid-season stretch when he challenged Michael Jordan’s consecutive games streak of scoring 25 points of more. 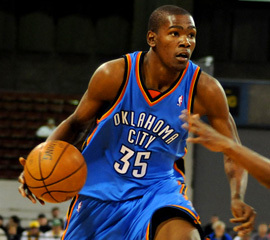 Durant fell short of that record but not before securing a playoff spot for his Oklahoma City Thunder in the process. Durant is not the only star on this young squad. The team formerly known as the Seattle Supersonics boasts the youthful Russell Westbrook and Jeff Green who are both averaging over 15 points a contest. This team will be pesky but the Thunder still lack veteran leadership. That will likely hurt them this post-season but not before they do some damage first. Every young team must experience some heartbreaking post-season losses before they mature. It builds character. This year, it will be the Thunder’s turn to do so. They are definitely on the right track but imagining anything more than advancing into the second round is likely wishful thinking. 6 – Will the Mavs’ new additions blaze a trail to the Finals? The Dallas Mavericks turned a corner mid-season when Mark Cuban pulled off a blockbuster trade, landing both Caron Butler and Brendan Haywood. The move immediately made them Finals contenders. They ran off 13 straight victories but then lost 6 of their next 11. Fans are left to wonder which Dallas team will show up in the playoffs. Dirk Nowitzki continues to prove he’s one of the game’s brightest talents and with every post-season exit, you can tell he wants to become an NBA champion more than ever. He’s on pace for another MVP season although he likely won’t win it. He’s averaging 25 points and 8 rebounds and recently dropped 40 on the Trailblazers in Portland. The seven-footer presents a mismatch for every team in the league but he can’t do it alone. That’s why they traded for Haywood and Butler. Dallas will need Jason Kidd at his best. His field goal percentage is up from years past. His shot selection will need to remain that way. 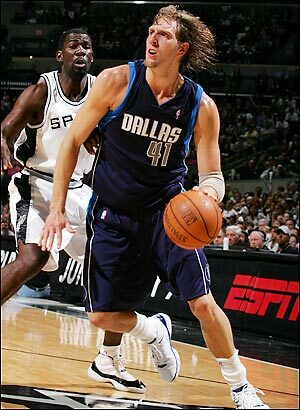 The Mavericks will also need a focused Shawn Marion and a healthy Jason Terry to provide a spark off the bench. The entire Maverick franchise wants nothing more than to shed their ‘soft’ label many have given them. They have the talent it takes to win a title but they will have to be clicking on all cylinders to make that become a reality. This entry was posted in Hardwood and tagged Al Horford, Andrei Kirilenko, Atlanta Hawks, Brendan Haywood, Carlos Boozer, Caron Butler, Dallas Mavericks, Deron Williams, Dirk Nowitzki, Jamal Crawford, Jason Kidd, Jason Terry, Jeff Green, Joe Johnson, John Stockton, Karl Malone, Kevin Durant, Mark Cuban, Marvin Williams, Mehmet Okur, Michael Jordan, Mike Bibby, NBA, NBA Finals, NBA Playoffs, Oklahoma City Thunder, Richard Jefferson, Russell Westbrook, San Antonio Spurs, Seattle Supersonics, Shawn Marion, Tony Parker, Utah Jazz by Chris Humpherys. Bookmark the permalink. Hill did a fairly adequate job filling in for Parker . I for am “stoked” about the playoffs ! I too am ready, Al. The last thing you want as a Spurs fan is to have them face either the Lakers or Mavs on the road. Given the Spurs’ recent form over the last 10 games. I’d think that the Mavs and Lakers would have more to fear from a resurgent Spurs’ team . Over the last 10 games the Lakers (4-6) , the Mavs (7-3) and the Spurs 7-3.
? I hear that Woods will be on-board as well . What was Amy’s big hit again ? Oh I remember “Rehab” . LOL,LOL,LOL !!! I agree, Al. The Spurs won’t be an easy out by any means. I can’t believe basically the entire Western conference is coming down to the final few games. Big Ben might be due for some involuntary rehab, Al, if the Commish has anything to say about it. I don’t think that Ben had much of a choice ! It was that or face a suspension or quite possibly being cut by the Steelers. I see that Holyfield fought Franz Botha over the weekend ? Their combined ages doesn’t even come close to Kirstie Alley’s bust size much less her weight . How’ bout them apples ? Holyfield fought this weekend, Al? I think I saw that on the AARP channel. And for some reason, I STILL cannot get over Roethlisberger’s mullet. This guy is making bad decision after bad decision. First forcing himself on women, then getting a bad haircut. Who’s advising this guy? Kevin Durant and the Oklahoma City Thunder will have to play the Lakers in the first round. After the bout with Holyfield Franz Botha then took a suppository and asked to be left alone for the next 48 hrs. Holyfield on the other hand upped his dosage of Viagra and went trolling for some skanks ! Goodell wants to apologize to the fans of the NFL for some of his indecisions. He now wants to make amends by holding a party at time and venue yet to be decided. There’s No Crying In Baseball …………. So That Must Mean There’s The Perception of Racism ………….. This piece should make you yearn for when baseball was really relevant unlike now ! For many of the alleged top tiered teams in the West it came down to physical as well as mental fatigue. Teams that are now found to be wanting will get dumped on big time ! Everyone wants to treat the Spurs as if they’re a rabid dog. But consider this they’re on the cusp of achieving something that hasn’t been in over two plus decades. And that’s to have a team win 50 games or more for 11 straight seasons. How ’bout them apples ? Well, Al, at least it sounds like everyone had a good time at the Holyfield-Botha fight… and afterwards. I’ll give you only one team in the West to make the Finals and I’ll let you choose first. Al… I heard that 50+ mark last night. Damn impressive. I’m still waiting to see who they face in the first round to determine how much of a chance they have. If we can keep that momentum going then should it be the Mavs I’d still like our chances ! See the MLBPA (union) wants to take MLB to court in Federal Court system ? They’re saying that owners and hierarchy of baseball colluded to deter free agents to be signed this off-season. No ! Real collusion is what Fehr , Selig and the owners did during the entire “steroid era” ! I know how you like to start the say off right . So here’s something that ought to get you over “hump day” . Al… I don’t know what to say about the Nuggets. I know they experienced a huge blow losing George Karl but they’ve gone from the number two seed to the number five seed in a matter of weeks. Phoenix has owned them this season and having to play them on the road won’t be fun for Adrian Dantley. And how about the job Alvin Gentry has done in the land of the sun. I’m impressed…. even though he still talks funny.